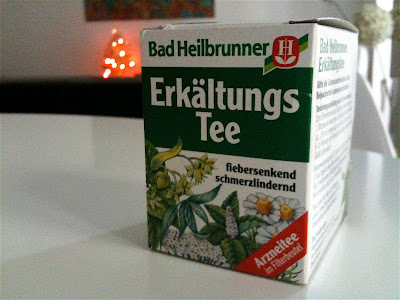 I am a great believer in the healing properties of tea, but here in Germany they take that belief a whole stage further. Walk into any chemist, drug store or supermarket and you'll find a whole stand devoted to medicinal teas. I came down with a fairly terrible bought of flu over New Year a few years ago and a German friend sent me home with a selection of teas she assured me would help me feel much better. I was somewhat skeptical - this was in my pre-tea obsession days - and can't really remember if I drank them, or if I did what impact they had. Well, New Year, new illness. This time it's Coffee Boy who has been nursing a stinking cold. Whilst purchasing herbal nasal sprays, echinacea bonbons and a variety of more heavy-duty drugs I happened upon a tea especially for colds. It contained such interesting things as Linden blossom, Elderberry leaves, Dandelion and Peony flowers. He wasn't convinced but was prepared to try anything so I prepared him a cup. And I must say, he felt much better after sipping the brew. So much so, in fact, that he has nearly finished the box. So it just goes to show, tea really is the best medicine. If you could email me your address I'll get it sent out asap! Katie, I am so excited - I never win anything. Emailing you my details right now. Thank you so much! Hallo Serap! Es ist wirklich super, von dir zu hoeren. Danke, dass du mein Blog gelesen hat. Ich wuensche, dass ich dein Blog lesen koennte, aber mein Tuerkisch ist nicht so gut! Aber die Bilder sehen sehr lecker aus! Wir hoffen auch, dass wir euch alle bald wieder sehen werden. Freues Neues Jahr! Having heard that the best remedy for flu was elderflower, peppermint and yarrow, I diligently gathered bunches of these herbs last year and then dried them. When my Chief Taster came down with flu, I plied him with cups of the herbal tea I'd made. Unfortunately, it turned out to be pneumonia! So can't actually say if it worked or not. However, I've been drinking it anyway and haven't yet come down with anything - crossing finger now! Wow Choclette, I'm impressed. Gathering your own herbs rather than just going to the chemist and buying some teabags! I wouldn't know yarrow if it smacked me in the face. Coffee Boy is definitely skeptical about alternative medicine but he was a big fan of this tea.